How to Combat and Treat Spots! I, as most of you out there, unfortunately do not have perfect air brushed skin. Sadly I do suffer from spots, blackheads, whiteheads, closed comedones, demons from hell, however you like to name them they are a fact of life. So in this blog post I’d like to go through the different tips and products that are out there to help! *Disclaimer I am not a dermatologist so cannot help with your specific issues. All of the below are from my own experiences and reading. All my favourite spot warriors! First there are some pretty basic things you can do first without even opening your wallet! Hydration! This came up in my travel tips blog (here), but I really can’t emphasise enough how much hydration matters for the skin. 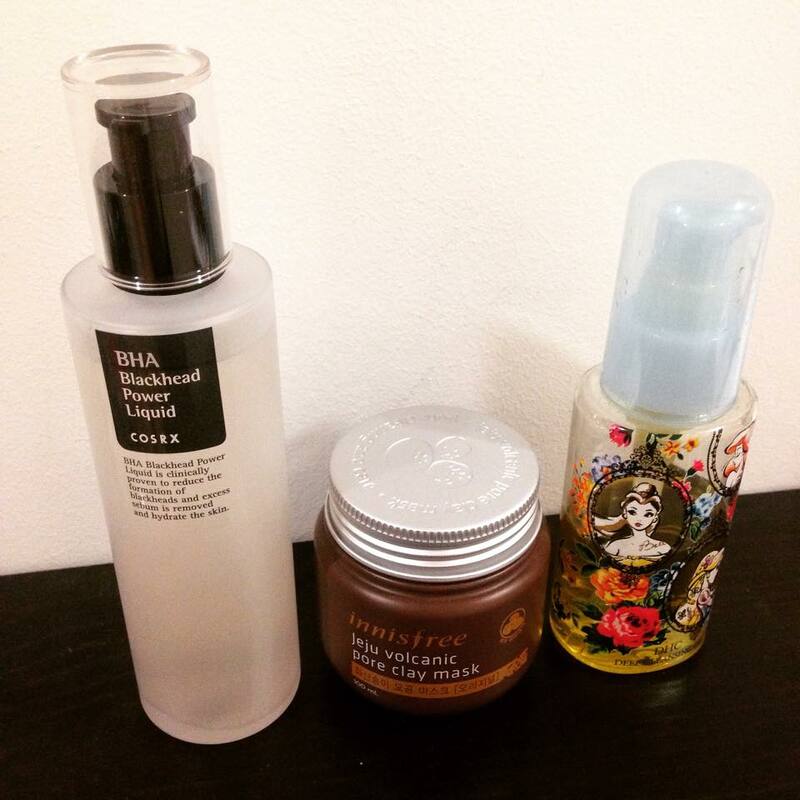 It’s easy to remember to moisturise but oh so easy to forget to hydrate from inside out. Sleep. When you’re lacking sleep the skin is the first place which suffers. Everyone knows about the dreaded eye bags in the morning, but it can also add to your acne woes. That nicely leads us to…. Clean everything! Remember whatever touches your face is going to influence it. I wash my brushes weekly using Johnson’s baby shampoo, a cheap alternative to brush cleansers out there. I also try and wash my sheets every two weeks, but in the mean time I flip my cushions over so I’m never using the same side continuously. Another good trick is to put a clean t-shirt over your pillow case! I have a separate towel for my face as well, which is washed weekly. There are plenty more tips out there, but those are three easy steps you can do now to make an impact, and all with minimal effort. Now onto the more fun part, products! Just like people acne comes in all different shapes and forms. You have your blackheads (open comedones), white heads (closed comedones), your blemishes and the all terrible cystic acne. I’m going to take you through the different stages and what I use to combat them! Exfoliation is important because it removes the dead skin cells from your face, preventing them from blocking pores and turning into blemishes and acne. It also helps lead to the elusive healthy glowing skin. There are two main types of exfoliation, chemical and physical. What is very important to keep in mind is that it is possible to over exfoliate leading to tight too shiny skin. 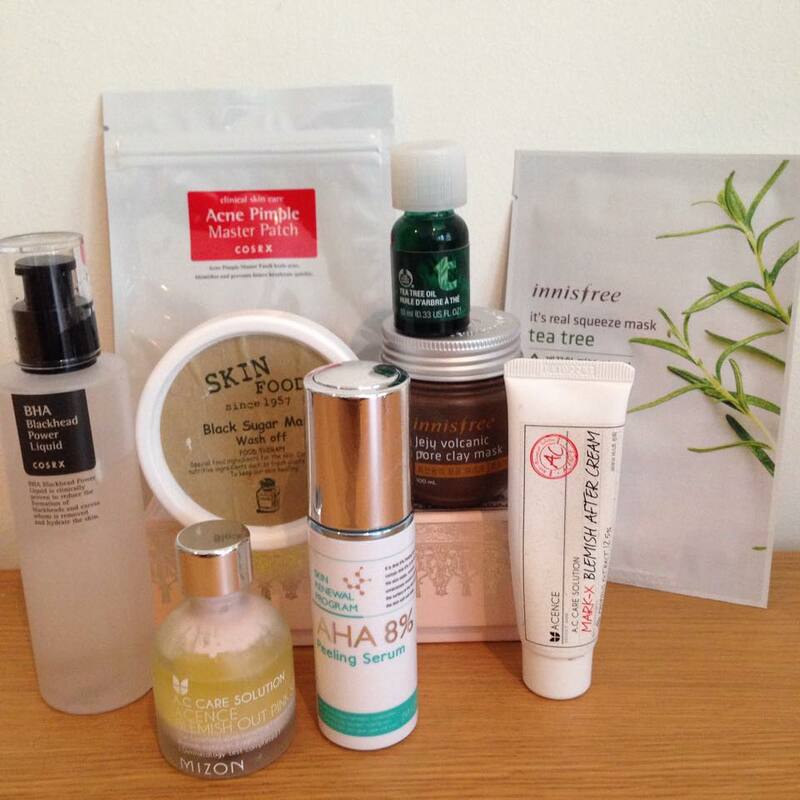 So whenever you introduce a chemical or physical exfoliator into your routine do it gradually. This type is usually used once or twice a week, to prevent the dreaded over exfoliation mentioned above. This type of exfoliation is rather intuitive, it uses a rough material such as grains, sugar or microbeads (which I wouldn’t recommend due to their damage to the environment) to rub away the dead layer of the skin. 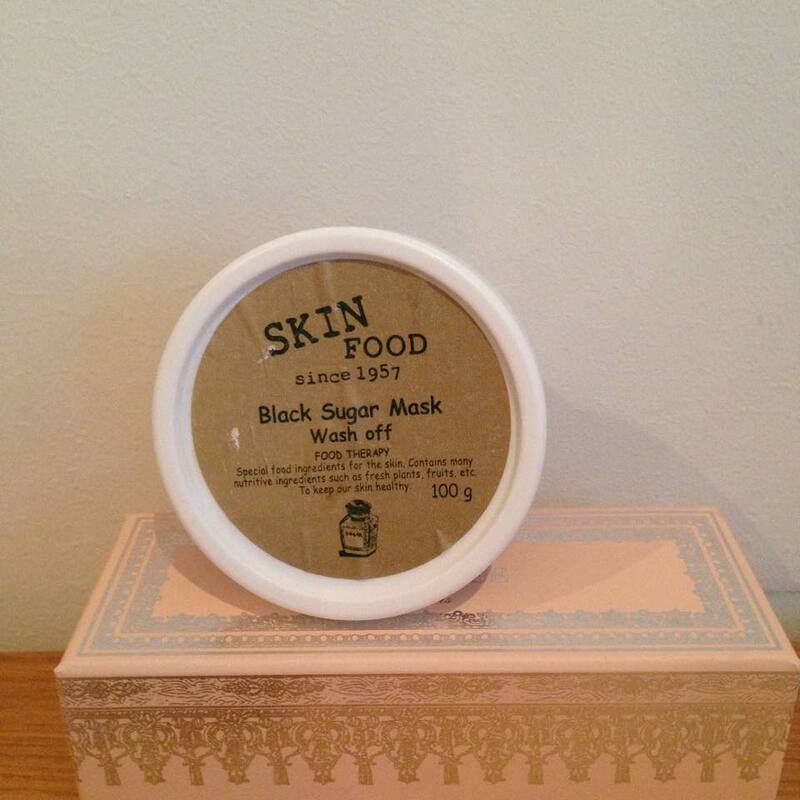 My personal favourite physical exfoliator is the Black Sugar Mask Wash Off from Skinfood. I love the smell of this and the way it makes my skin feel new and glowy. I keep the mask on for 10 minutes and then wash off, gently rubbing my face in circles as I do so. If you find it too harsh a top tip is to wet your face first, it becomes less harsh the more wet your face is when you apply the product, so you can customise to suit. Salicylic Acid (AKA the BHA): Full name Beta Hydroxy Acid, is a lipid (oil) soluble chemical. 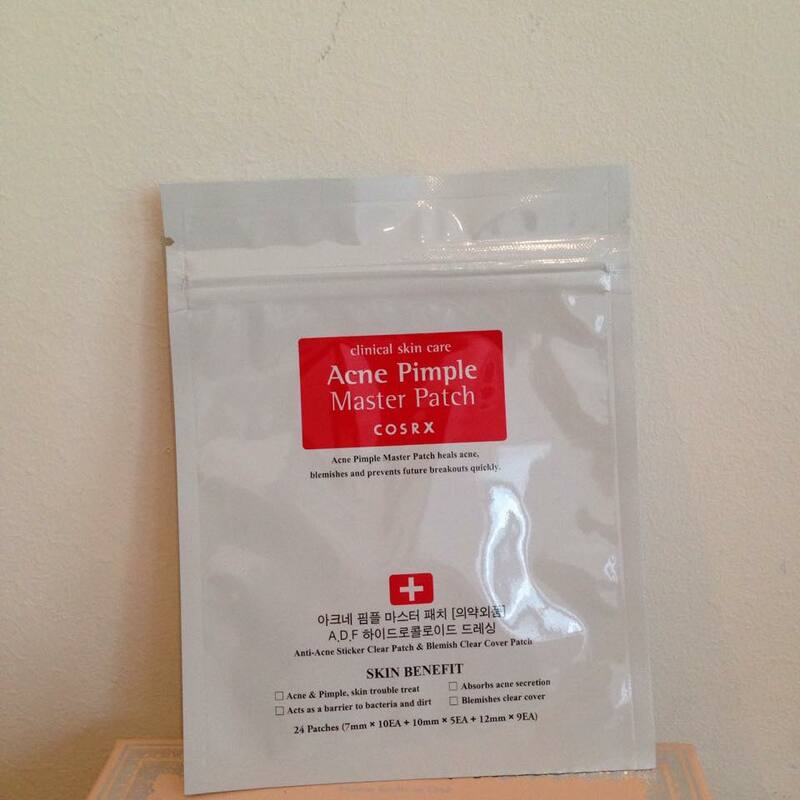 These are more effective with blackheads as it can penetrate through the oil that causes them to appear. 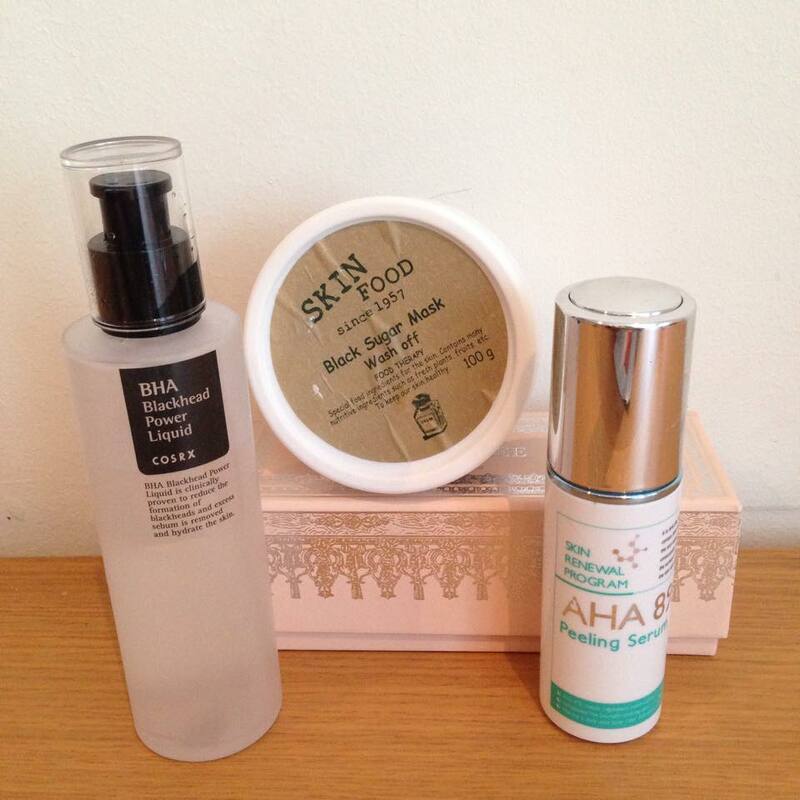 BHA’s are also anti-inflammatory and anti-bacterial, so if you have sensitive/red skin these will also help with that. This is an excellent exfoliator which works to break down skin cells and physically declogs pores by breaking down filaments/blackheads/whiteheads from the inside keeping the pore clean! Don’t be tempted to over-exfoliate though, these acids are strong and it can take a while for your skin to get used to it. I only use my BHA treatment twice a week, three times if I’m under a lot of pressure at work as more stress for me leads to more spots. These are great for people with oily skin, or those prone to break outs. 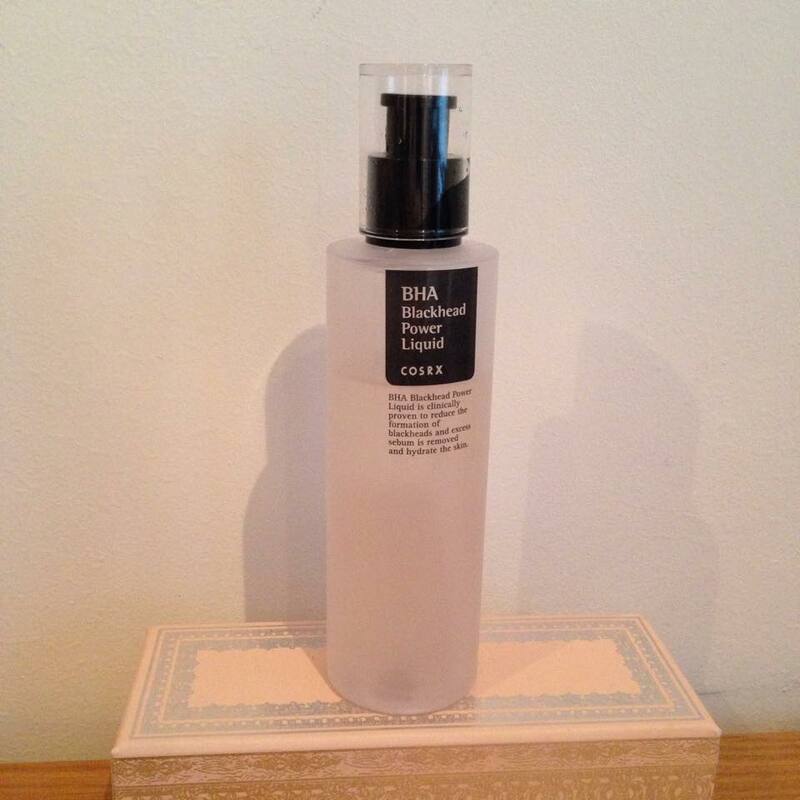 The product I use is COSRX Blackhead Power Liquid. I pump it twice onto a cotton pad and then sweep across my face. Alpha Hydroxy Acid (AKA the AHA): This is a water soluble chemical. It works differently to BHA’s in that they target the skin’s uppermost layers, compared to BHA’s which break down through the skins oil. 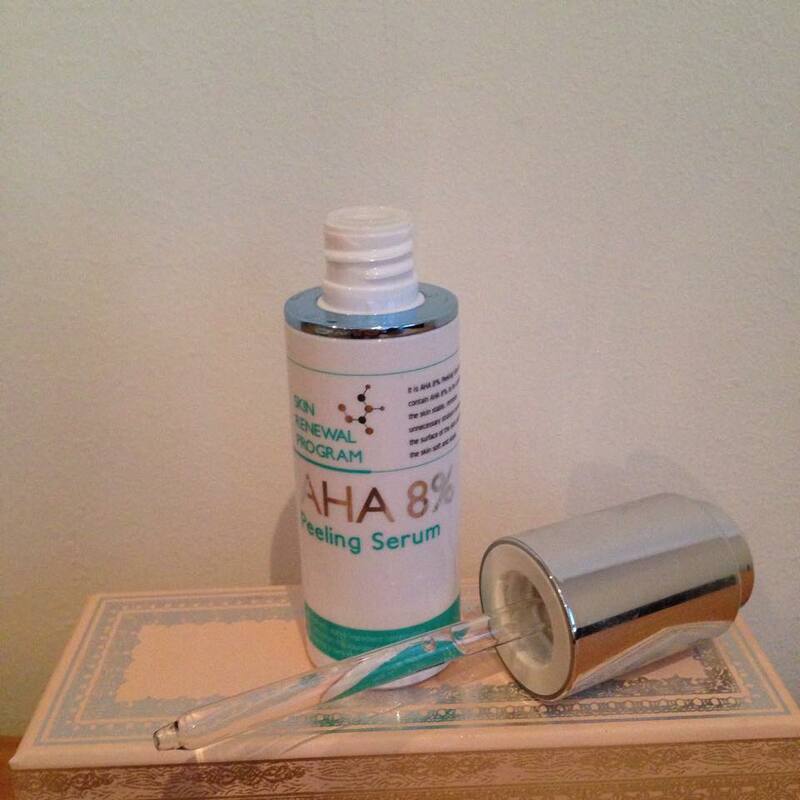 While BHA’s target blackheads, the AHA is good for targeting white heads and hyperpigmentation/skin discoloration. AHAs can be more irritable than BHAs so that is something to keep in mind if you have sensitive skin. I use this twice a week, and put it on 20 minutes after the BHA so that I can get the full effect. AHAs and BHAs both work better at a lower pH to exfoliate, which is why I wait. You can also get pH adjusting toners to shorten the wait time, but sadly I don’t currently have one in my collection. 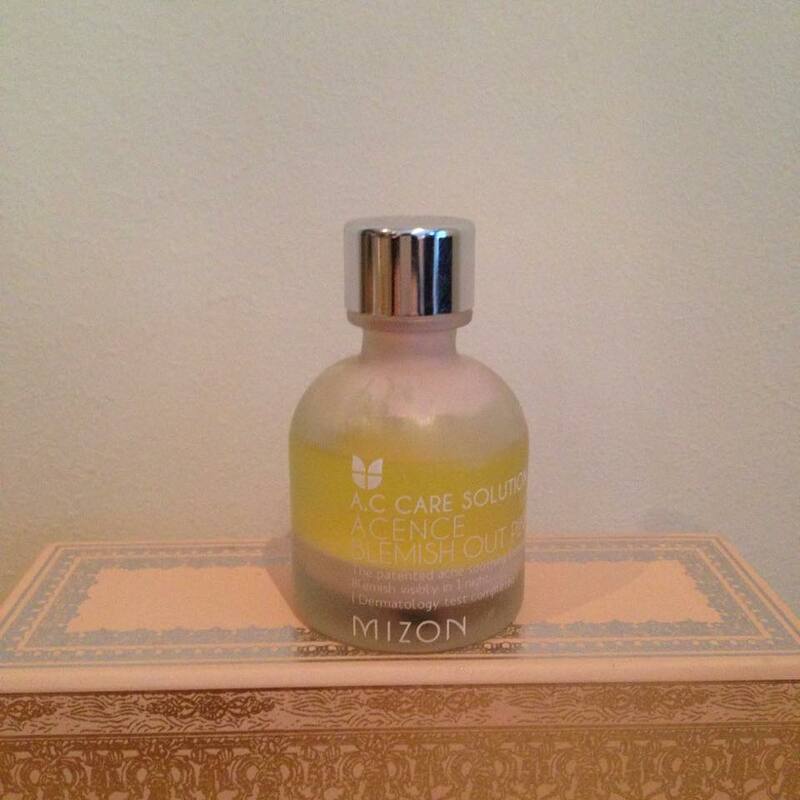 The product I use is Mizon 8%, which has a dropper application that I apply directly to my face. With the best will in the world, and all the preventative measures scrupulously followed the dreaded can still occur and a pimple appear. The following is how I address the horror and maintain my sanity by re-assuring myself it’s not the end of the world. So a whitehead has made its unwelcome appearance on your face, and it must be dealt with. There are two stages for me in this process, in addition to my normal AHA inclusive skincare routine. Stage 1: Dry it out and bring to a head. Sometimes you can feel a white head on your face, it’s painful to touch and you can see it’s going to be one of those monstrous 1-2 weekers. The first thing I do is bring it to a head quicker using a pink spot treatment. These are nothing new, and you can find Western and AB brands all over the net. But below is a review of my favourite. 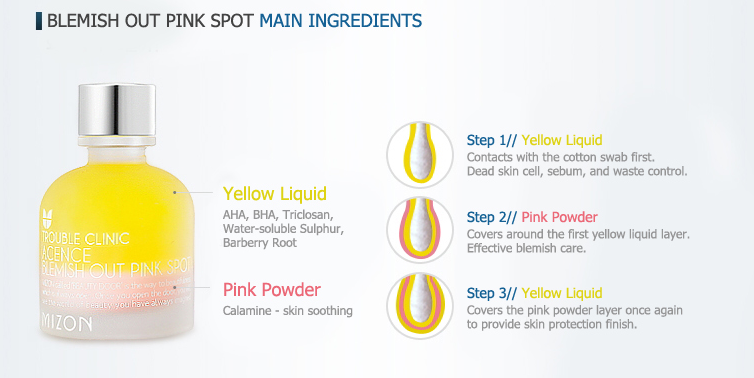 This has a two layer structure, first is the yellow fluid layer which is made up of AHA, BHA, Triclosan, Sulfur and Coptis Japonica Makino. Triclosan is a preservative which is antibacterial and anti-fungal! Mizon highlights this as one of their star ingredients, and it’s not hard to see why. It’s multi-functional in keeping your product fresh as well as getting rid of the bacteria on your skin. Coptis Japonica Makino is also an anti-bacterial ingredient, well known in herbal medicine to be used as an anti-inflammatory and antibiotic. Random skincare fact! Coptis used to be commercially marketed as an effective thrush infection treatment! (Would not advise you do this now :P). The pink layer is calamine lotion. Anyone who has ever suffered from chicken pox or had an entanglement with poison ivy is probably familiar with this. 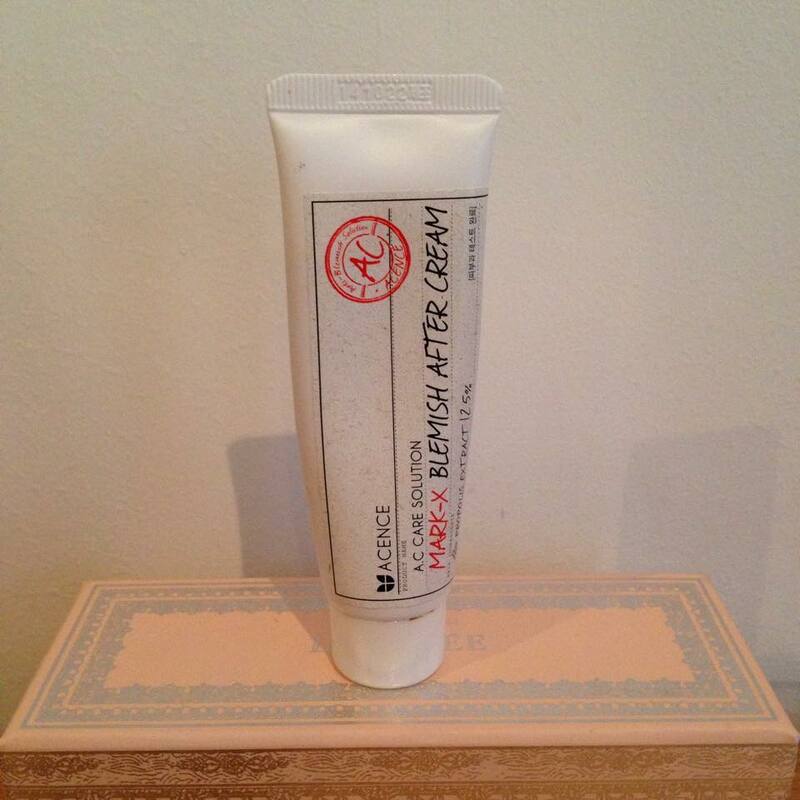 It has a soothing effect on the skin and helps reduce the redness. This is the last thing I put on before I go to bed. Using a cotton swab I dip straight down into the bottle slowly, to prevent the solution from mixing, and press firmly into the pink powder. Carefully drawing it back up, so as to prevent it from hitting the sides I then apply to the spot offender. This is a HG product for me. I can’t recommend it enough to those who suffer from inflamed bumps on their face for weeks. If the products mix you just leave it on a flat surface for them to separate back out. There’s also plenty of product in the bottle which is always a plus. Once I’ve got a whitehead to appear, or I have an open blemish I slap on an hydrocolloid bandage. 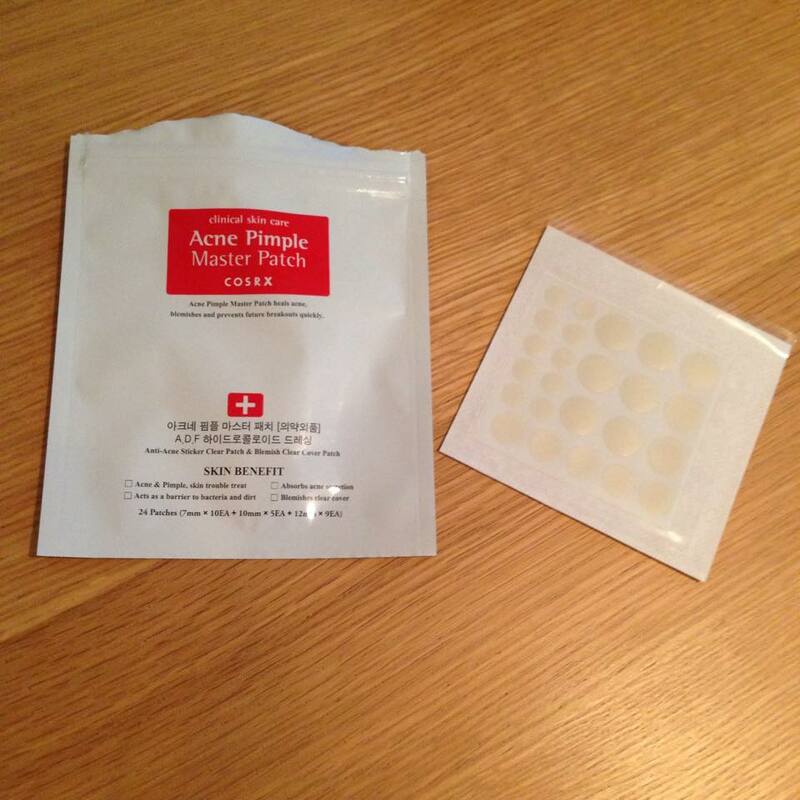 I cannot emphasise how much I love these patches, and how they’ve changed my skincare life. The technology for these babies originally came from medical care wounds. They were used to gently encourage wounds to heal, while protecting them from bacteria and other nasties. I love them. 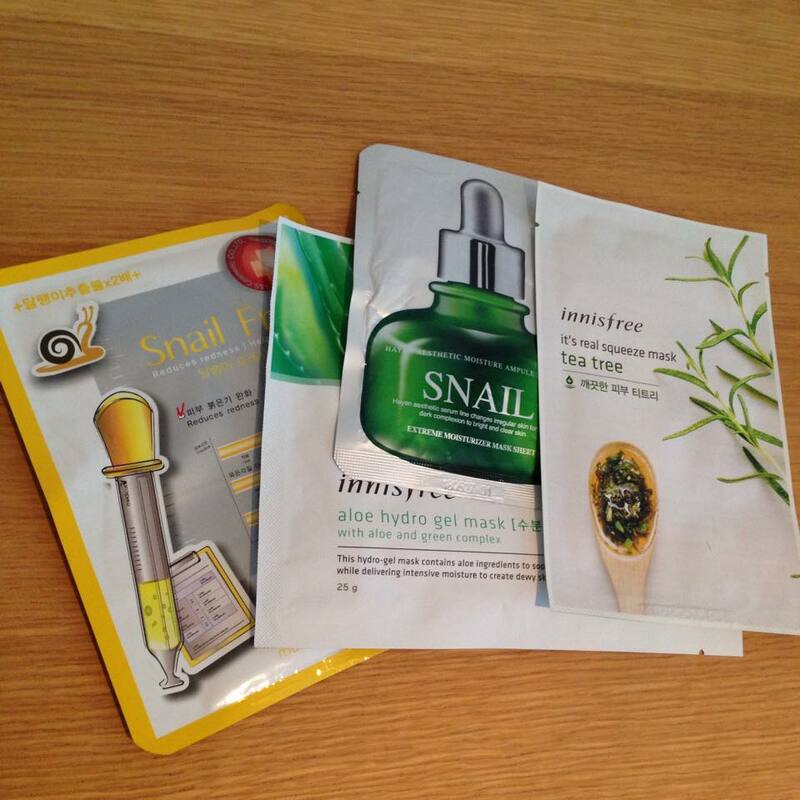 Whenever I make a skincare purchase I always add a sheet of these to my basket. These are tightly packaged. Once you open the foiled re-sealable pack you come across the double sealed patches themselves. There are 9 big (12mm) patches, 5 medium (10mm) and 10 small (7mm) for a total of 24 patches in every bag. This is the last thing that goes on at the end of my night routine. I clean the moisturiser/sleeping pack off the affected area with a cotton swab and stick one of these over the entire blemish. These patches are adhesive enough that they stay on my face the entire night, and in the morning I take it off before my morning routine. You’ll find after usage that the patch is cloudy and slightly bumpy, this will be the gook that it’s drained from the blemish. Just to reiterate, in case you didn’t know already, I love these patches. They do what they’re meant to do, drain and flatten as well as protect from the outside environment. The only issue is that you can only use this for targeted treatment, and it can get expensive if you have a big flare up at once. 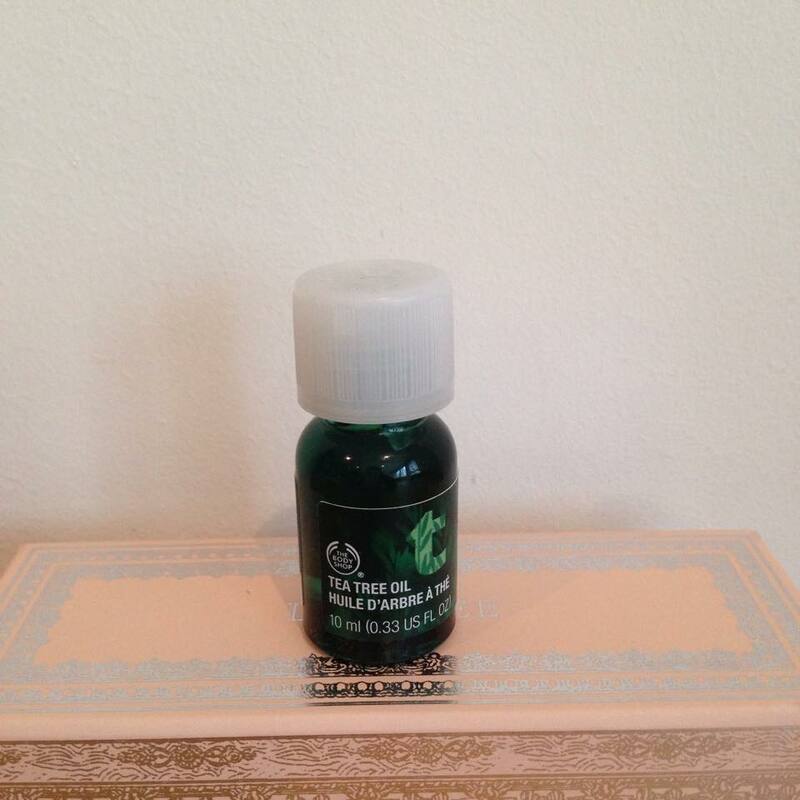 Tea tree oil is a well known remedy for redness and blemishes on the skin. It’s an anti-inflammatory, which is good for helping with reducing the redness/swollenness of the blemish. Its also antibacterial so helps kill off the germs/bacteria on the skin and cleans pores. I use the tea tree oil that The Body Shop sells. But the LJH Tea Tree Essence is a popular AB choice. I add a couple of drops of the oil to my night time moisturiser, as if I use it straight on my skin it can irritate my face. If I’ve got a particularly stubborn blemish/spot I will apply directly using a cotton bud, but be warned this does sting. This is for use on open or healing spots. I wouldn’t recommend applying this on a growing spot and expecting miracles. It does however reduce redness and helps the skin heal a lot quicker than if you just left it. The main ingredients in this cream which help troubled skin are propolis, niacinamide and liquorice. Liquorice has been used since the Ancient Greeks to help troubled skin, its an anti-inflammatory and has been shown to reduce swelling, redness and irritation. Niacinamide is a brightening product which can help even out skin tone and propolis is a fan favourite for its antiviral and antimicrobial properties. 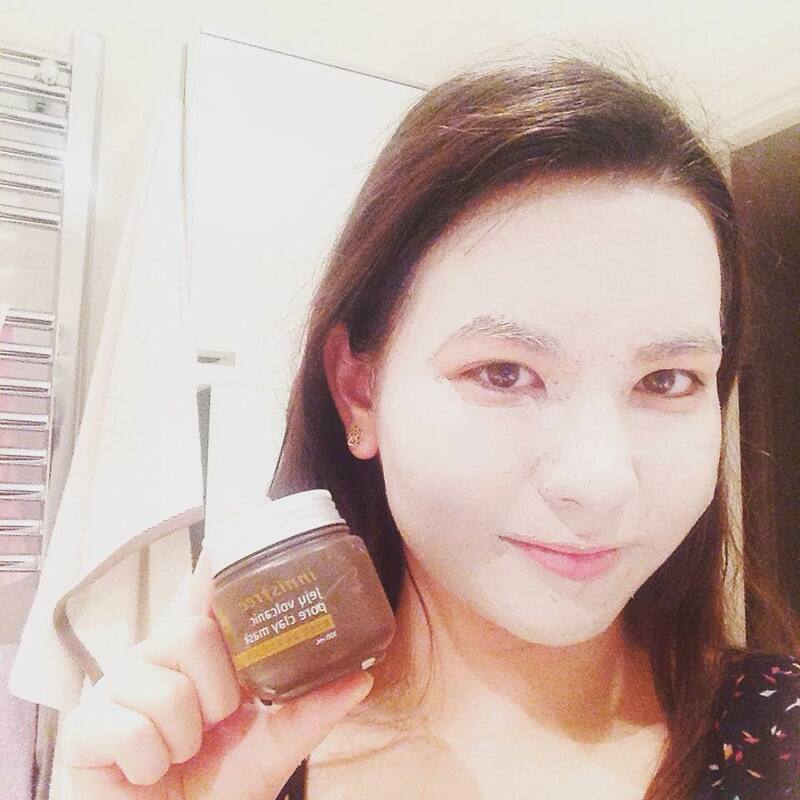 The cream contains 12.5% propolis extract! As with the other spot treatments I put this on last in my routine. I put a healthy dollop on the affected area and go to sleep. One thing to note is that it does have a medicinal scent, though this quickly fades. This is a great product to use in the last healing stages of a spot breakout as it speeds things along and helps your skin go back to its usual even glow. Again to note this is for the healing stage, you apply to open or already popped acne. If you apply to a whitehead which has yet to be drained/popped it won’t be even half as effective. One of my face pet peeves is the sebaceous filaments on my nose, which some of you may call blackheads due to terrible advertising practises. What follows is an everyday person’s explanation of what they are and how to treat them! Sebaceous Filaments: These are natural formations on your skin which channel sebum/oil from your pores onto the skin to moisturise. When pressure is applied white gunk comes out. There are differences in how pronounced they look, people with oily skin (like myself) have more obvious sebaceous filaments. But trust me everyone out there has them, there’s no such thing as pore free skin! But just because I know they’re natural doesn’t mean I like them and there are a few things you can do to minimize their appearance. Do not overuse pore strips!! These are admittedly fun to use, I am guilty of slapping one of these on and then being fascinated by all the gross stuff that’s come out. But these can be damaging to the skin, leaving behind open pores which are vulnerable to infection and removing essential natural oils from the skin causing redness and drying. Also while these are great at removing blackhead clusters, sebaceous filaments are not something which can be removed! So you’re only going to be disappointed by the lack of gunk on the strip, while causing mild irritation and worse case scenario, broken capillaries. These are my go to when I want to tighten my skin. Clay has great oil absorbing properties which helps to keep pores free of excess oil and minimises the appearance of the sebaceous filaments. 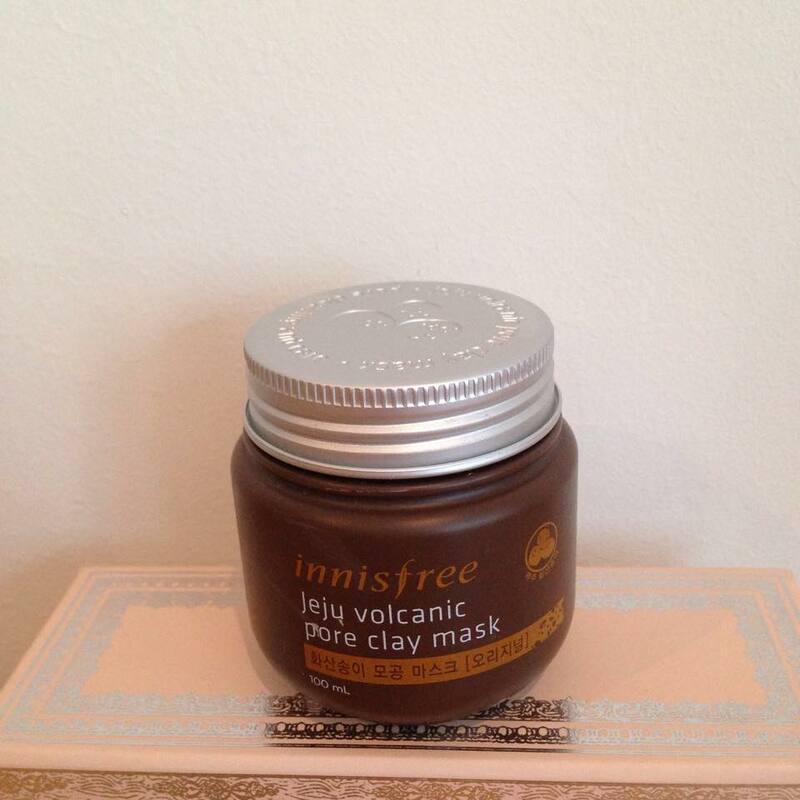 My favourite go to clay mask is Innisfree Jeju Volcanic Pore Clay Mask. I apply this after cleansing and wait for 15 minutes/scare my friends on snapchat. It is easy to apply and you don’t require much product to cover your entire face. For a clay mask this isn’t too drying, which can be the worry people with dry skin can have. It can be difficult to completely wash off just using water, so I use an oil cleanser/balm to help in the process. Face OilsThere’s nothing so counter intuitive as saying add more oil if your face is oily, but its true. One of the reasons your face might be over-producing oil is because it doesn’t think it has enough, Fixing this is easy, add an oil cleanser to your routine! Not only does it help to remove the build up of dirt and make up from the day it is known to help with the appearance of sebaceous filaments. An added benefit is that oil is highly emollient, which makes the skin feel oh so soft. Some of the popular natural mineral oils out there for this are jojoba, argan and black cumin seed oil. I was intrigued, and one evening when I had about an hour spare to try it, I got to work! First went on the BHA, then I watched an episode of friends to while away the 20 minutes. 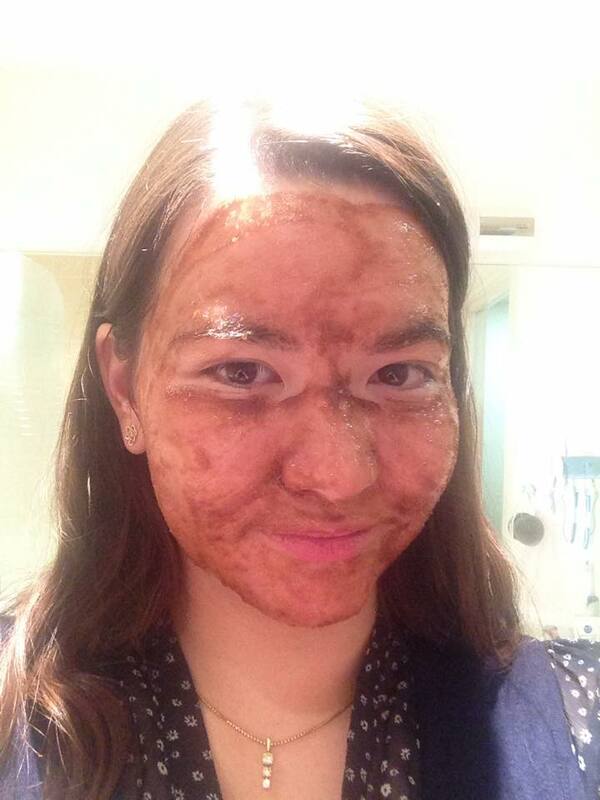 Next I applied the Jeju Volcanic clay mask and waited another 20 minutes. I then washed this off using tepid water as advised by Fiddy. Finally it was the cleansing oil stage and another 20 minute wait. Before I could massage my face and get the satisfying grit cleaning feeling. Then a final emulsify and rinse of my face before I carry on to the essence stage of my routine. You can see that the whole process took an hour, which is why I only really do this once a fortnight. But it does work! My pores did look smaller than they usually do and my skin felt really clean.An extra stage I do is apply a sheet mask that night. This is because I really want to pamper my skin after applying that much pressure to it in the massaging stage. I really recommend to those with dry skin that they do this extra stage. Masterpost, Review, Routine, Spots. Bookmark. Thank you for your kind comment 🙂 I'm glad that you enjoyed reading it. BHA's are really great for blackheads and overall reducing redness, it's been a lifesaver for me, so I hope it works for you as well!